The best deals are those that involve getting the same product or service for a lower price. This is why exercising at home is best. No more gym rats. No more sweat-infused-axe-spray nausea. No more machine hogs. Think about how much less effort you’ll have to put into preparation for the gym. Let’s talk about getting your apartment ready for exercising. Obviously, if your goals aren’t similar to the outcomes desired by body builders, then you won’t need as much equipment as a typical gym. You just want to do cardio? Maybe, then, all you’ll need is a space for a yoga mat. Want to get really buff? 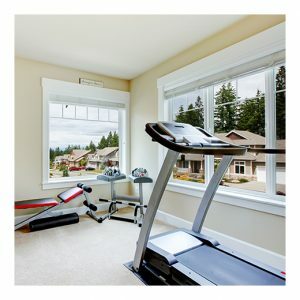 The nice thing is, your apartment most likely has a fitness center that already includes some equipment. You’ll only have to make space for what the fitness center doesn’t have. And don’t just brush off using the fitness center all at once. Research has shown it’s actually easier to form habits, like going to the gym, if you begin with small goals first. Maybe your first time lifting weights shouldn’t be at LA Fitness. Not only might you get discouraged, but missing a few days can turn into a few weeks and then you’ll be back at square one again. If you want to build muscle, just begin with the basics: a quick ten-minute warm-up, followed by a period of strength training (pushups, pullups, squats), followed by a ten-minute cool down period. As simple as it is, beginning with this kind of routine will prepare your tendons and joints for heavier loads. And it has the added bonus of pushing you to form new habits. The only other thing you’ll have to think about is how to store what you need. If you’re just getting a jump rope, you won’t have much of a problem. But if you need a bench press, for instance, you might have to get a little creative if you’re living in an apartment. Pick a space to use your equipment in. But this space doesn’t necessarily have to be used to store your equipment. Another thing you can do is think about ways in which the storage space for your equipment can be used for other things. For instance, maybe your bench press can hold your plants. Maybe your bars can double as a coat hanger. There’s really no limit on what kind of uses you can put these things to. If you want to begin exercising, just start at your apartment. Maybe use the fitness center, if your apartment has one. But if not, no big deal. Form the habit of exercising before you make lofty goals for yourself. That way, when the time comes to lift big weights, not only will your tendons be ready, but your mind will be ready too. The post Begin Exercising at Your Apartment appeared first on Apartments For Us.